A young girl, Jessie, befriends a unicorn and embarks on a series of adventures. Jessie starts out as a very timid girl, always the one being left behind and forgotten by her family, but begins to grow, finding strength in body and spirit through her adventures with Gus, son of the Great Unicorn King. Gus too is struggling to become the son that his father always wanted him to be. As Gus and Jessie become embroiled in a series of adventures, their bond deepens and their confidence grows as they learn to put others needs above their own, often calling upon an unwavering bond of friendship and a true sense of courage that neither knew they had. 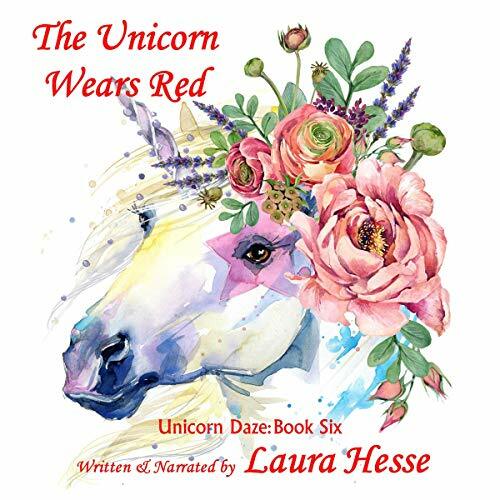 The Unicorn Wears Red is a fun short Valentine’s Day adventure that is part of a series for kids about a unicorn and a girl. The book will make more sense to readers (and listeners) who have read the previous books, but it should be fun for most elementary school age kids who like unicorns. The book is read by the author who does an ok job. Listening to it is more like story time at the library than a radio play. I received a complimentary copy of this book. This is my honest and voluntary review. The story is very cute, and the author reads it well. My only problem is the sound it a tad muddy. This is a children's story, so they likely wouldn't care about the sound issues. Characters did come back from an earlier book, so you might choose to read in order, but I was not confused in the least. This series is generally a hit with my young daughters and this one was too. I think they got into the Christmas episode a tad bit more than this one. (But that's hardly surprising -- beating Christmas-anything is a pretty high bar for kids.) This plot kept them interested, as did of course unicorns, magic, and the occasional sound effect. It was also a good length. Just right for listening to in a single sitting. This book was given to me for free and I provided this voluntary review.